These days I prefer to have my iPad firmly attached to my leg during flight. I’ve tried having it on the windshield or attached to the side of the airplane, but it always seems too far out of reach and hard to manipulate. 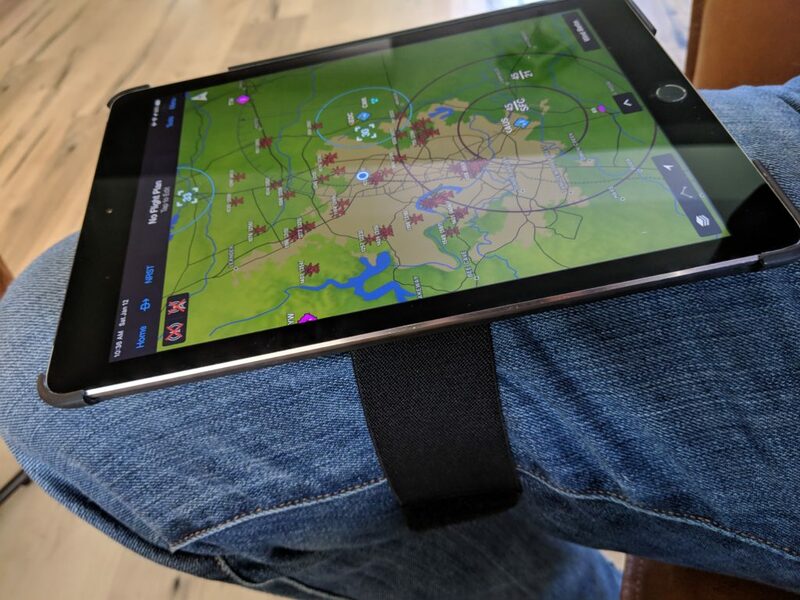 With the iPad on my leg I can bring up approach charts, look up approach frequencies, and use the scratch pad functionality in Garmin Pilot to take notes. 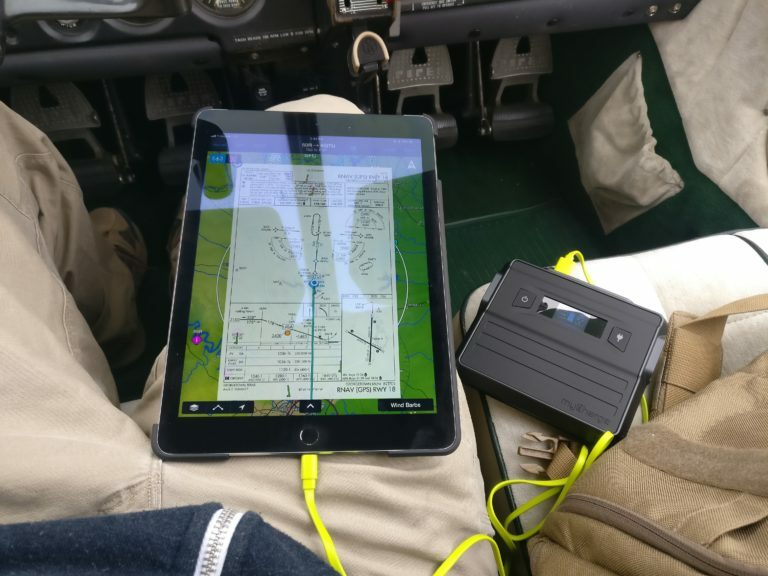 I’ve gone through a number of iPad kneeboards, none meeting my needs just yet. Until this one. The case is made from “smooth polycarbonate” (plastic) with some metal fittings on the back. 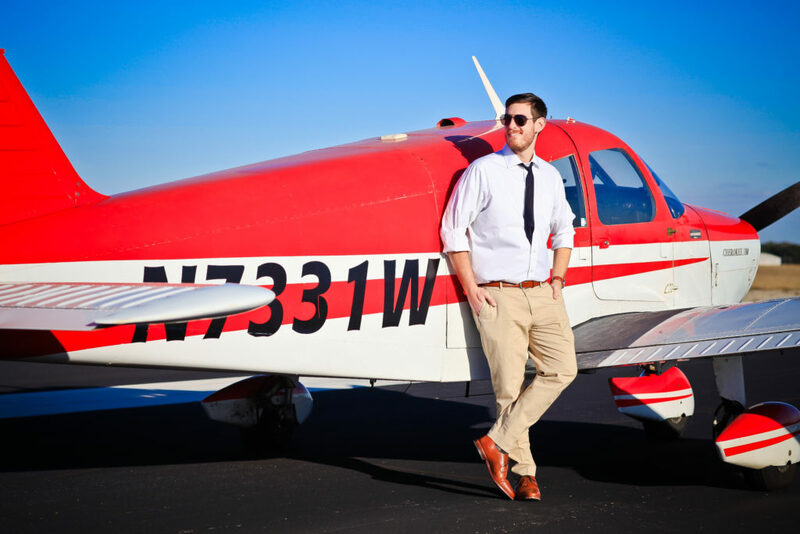 There’s a stretchy velcro covered strap that fits through the metal fittings on the back and allows you to keep the kneeboard firmly attached to your thigh. First, I really like the overall design. 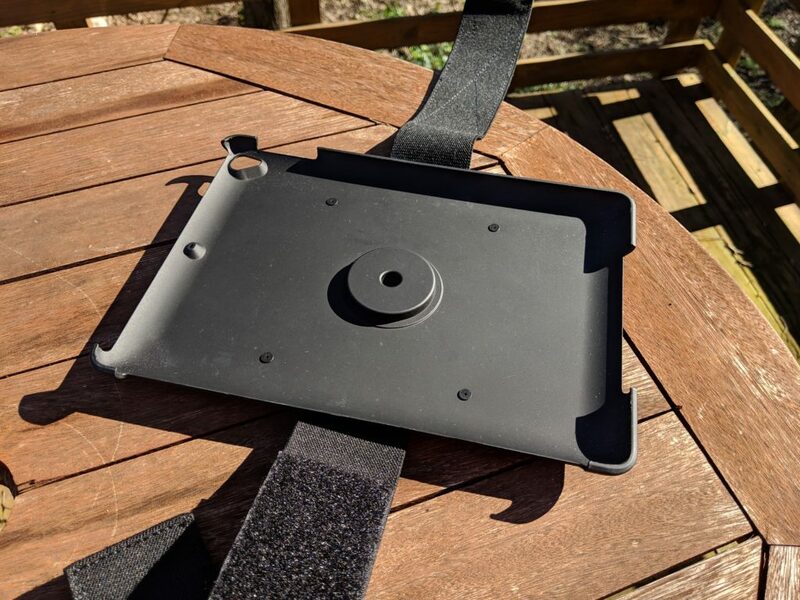 Unlike some other kneeboards this one attaches to your iPad as slimly as possible, with only a little bit of plastic around the edges to keep it in place. Those gripping edges are also really well placed. 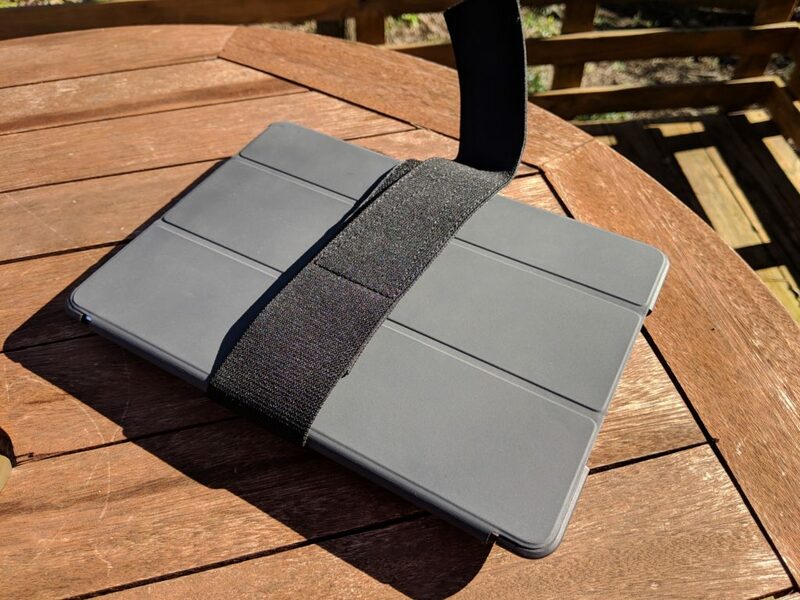 I like using the magnetically attached cover on my iPad when storing it and carrying it in my bag. 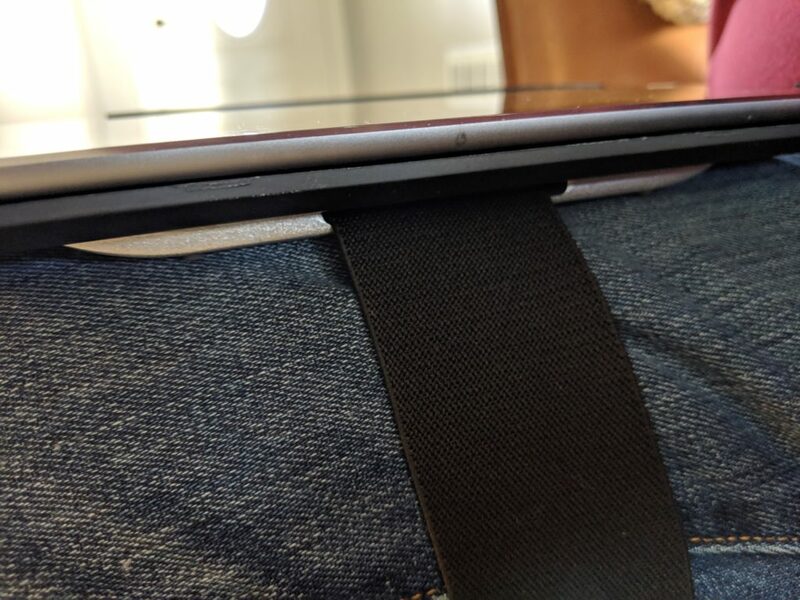 This case seems to have been designed very carefully to make sure that the Apple iPad cover will still work perfectly even with the case attached. And, pro tip: the velcro straps can be tied around the front to make that case cover even more secure. Speaking of making sure things work right, there are cutouts in the case to enable the camera on the rear of the iPad to continue working just right. Even with the bloated rear (more on that in a second) the field of view of the camera is still clear. 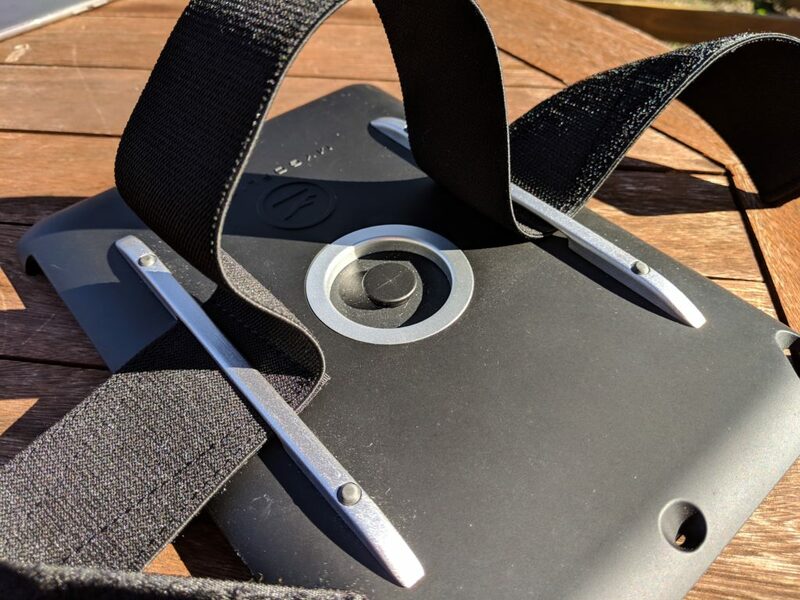 The metal fittings on the rear of the case are perfectly placed to be on either side of your thigh when attached, which feels really great in the air. It also feels very secure, and there’s very little moving around that the tablet does. The observant among you may have noticed that this tablet also has a circular attachment mount in the center of the backside of the case. That’s a mounting point for MyGoFlight’s Sport Mount system, which allows you to choose how you want to mount your tablet in the cockpit. Can’t decide between a kneeboard and window mount? Good news! No need for a second case! It works with the wide array of mounts available within the system as-is. That brings me to the only big complaint I have about this case. In order to accommodate this mount type the case is about a half an inch thicker than the original iPad you’re attaching it to. Honestly it’s not really that annoying, but when you’re trying to slim down your flight bag it feels like a lot of wasted space that could have been used for something else. That space isn’t even really well used. On a hot day here in Texas my iPad still overheats when in the case. There’s no ventilation in the case, meaning the stagnant hot air is trapped and keeps the iPad a little hotter than normal. It’s not great, but once you get up to altitude and crack the vents it’s a problem that is quickly solved. Some ventilation in the back of the case would have been appreciated in my opinion. Despite the bulging back I really like this tablet. It’s well designed, doesn’t get in the way in the cockpit, and allows all the original functions of the iPad to continue working just fine. Of all the iPad kneeboard mounts I’ve tried this is the winner for me. The case is a bit thick. I would have preferred either if the case had a slimmer option that doesn’t have the mounting point on the back, or a little ventilation as an option. Then again, five minutes with a Dremmel and that can be fixed.